Each mathematical object in GeoGebra has its own properties. Some of the properties of a line, for example, are its equation, color, and thickness; while a slider has maximum, minimum, increment, and animation properties. The properties of mathematical objects in GeoGebra can be modified using the Object Properties window. 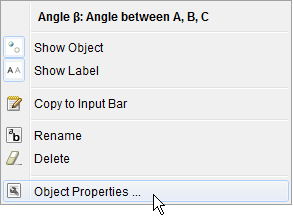 The Object Properties window can be shown by right-clicking a particular object and choosing Object Properties from pop-up menu as shown in the first figure.